Defined by exceptional craftsmanship, each piece in this bedroom collection brings a warm, restful quality to a bedroom. Regardless of the style - urban loft, farmhouse, lake house – this group’s subtle distressing, solid hardwood construction, and bold silhouettes are an ideal add to your space. Available for both youth and master bedrooms. Tasteful distressing and subtle finish variations should be expected and enjoyed. 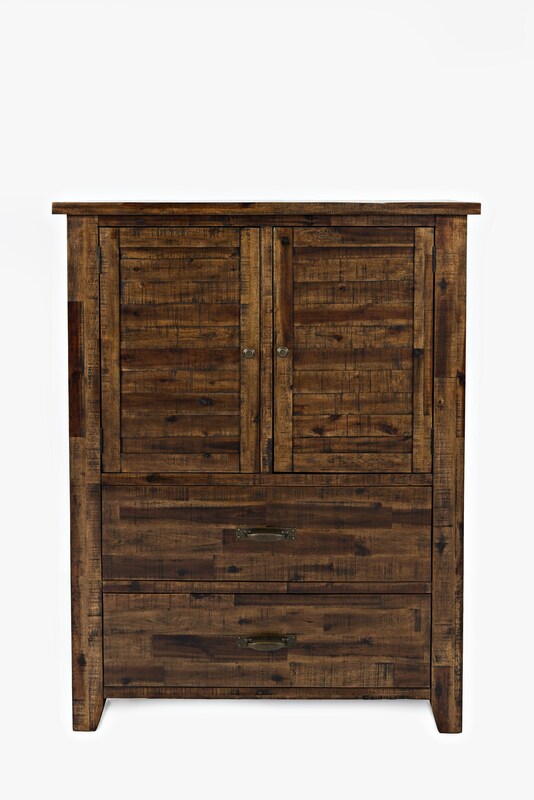 The Sonoma Creek Door Chest by Jofran at Zak's Home in the Tri-Cities, Johnson City, Tennessee area. Product availability may vary. Contact us for the most current availability on this product. Storage Doors open to two separate cabinets. Overall dimensions on each cabinet at door opening are 16"W x 15.5"D x 24.75"H. Door opening bisected by adjustable shelf; shelf dims are 19"W x 15.5"D. Drawer Dimensions: 31.25"W x 13.25"D x 8"H.
Browse other items in the Sonoma Creek collection from Zak's Home in the Tri-Cities, Johnson City, Tennessee area.